Neptune. Processed image from Voyager 2's narrow-angle camera 16 or 17 of August 1989. Neptune's south pole is at the bottom of the image. The exploration of Neptune has only begun with one spacecraft, Voyager 2 in 1989. Currently there are no approved future missions to visit the Neptunian system. NASA, ESA and also independent academic groups have proposed future scientific missions to visit Neptune. Some mission plans are still active, while others have been abandoned or put on hold. 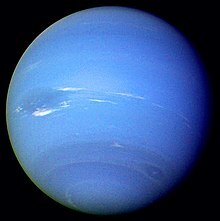 Neptune has also been scientifically studied from afar with telescopes, primarily since the mid 1990s. This includes the Hubble Space Telescope but most importantly ground-based telescopes using adaptive optics. After having visited Saturn successfully, it was decided to continue and fund further missions by Voyager 2 to Uranus and Neptune. These missions were conducted by the Jet Propulsion Laboratory and the Neptunian mission was dubbed "Voyager Neptune Interstellar Mission". Voyager 2's observation phase of Neptune began 5 June 1989, the spacecraft officially reached the Neptunian system on 25 August and the data collection stopped on 2 October. Initially it was planned to use a trajectory that resulted in Voyager 2 passing around 13,000 km (8,100 mi) from Neptune and 82,000 km (51,000 mi) from Triton. The need to avoid ring material detected by stellar occultations resulted in this trajectory being abandoned and a trajectory that largely avoided the rings but resulted in more distant flybys of both targets. On 25 August, in Voyager 2's last planetary encounter, the spacecraft swooped only 4,950 km (3,080 mi) above Neptune's north pole, the closest approach it made to any body since it left Earth in 1977. When the spacecraft visited the Neptunian system, Neptune was the farthest known body in the Solar system. It was not until 1999, that Pluto was further from the Sun in its trajectory. Voyager 2 studied Neptune's atmosphere, Neptune's rings, its magnetosphere, and Neptune's moons. The Neptunian system had been studied scientifically for many years with telescopes and indirect methods, but the close inspection by the Voyager 2 probe settled many issues and revealed a plethora of information that could not have been obtained otherwise. The data from Voyager 2 are still the best data available on this planet in most cases. The exploration mission revealed that Neptune's atmosphere is very dynamic, even though it receives only 3% of the sunlight that Jupiter receives. Winds on Neptune were found to be the strongest in the Solar System, up to three times stronger than Jupiter's and nine times stronger than the strongest winds on Earth. Most winds blew westward, opposite the planets rotation. Separate cloud decks were discovered, with cloud systems emerging and dissolving within hours and giant storms circling the entire planet in 16–18 hours in the upper layers. Voyager 2 discovered an anticyclone dubbed the Great Dark Spot, similar to Jupiter's Great Red Spot. However, images taken by the Hubble Space Telescope in 1994, revealed that the Great Dark Spot had disappeared. Also seen in Neptune's upper atmosphere at that time was an almond-shaped spot designated D2, and a bright, quickly moving cloud high above the cloud decks, dubbed "Scooter". The fly-by of the Neptunian system provided the first accurate measurement of Neptune's mass which was found to be 0.5 percent less than previously calculated. The new figure disproved the hypothesis that an undiscovered Planet X acted upon the orbits of Neptune and Uranus. Neptune's magnetosphere was also studied by Voyager 2. The magnetic field was found to be highly tilted and largely offset from the planet's centre. The probe discovered auroras, but much weaker than those on Earth or other planets. The radio instruments on board found that Neptune's day lasts 16 hours and 6.7 minutes. Neptune's rings had been observed from Earth many years prior to Voyager 2's visit, but the close inspection revealed that the ring systems were full circle and intact, and a total of four rings were counted. Voyager 2 discovered six new small moons orbiting Neptune's equatorial plane, and they were named Naiad, Thalassa, Despina, Galatea, Larissa and Proteus. 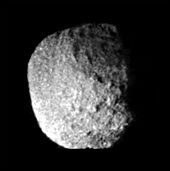 Only three of Neptune's moons were photographed in detail: Proteus, Nereid, and Triton; of which the last two were the only Neptunian moons known prior to the visit. Proteus turned out to be an ellipsoid, as large as gravity allows an ellipsoid body to become without rounding into a sphere. It appeared very dark in color, almost like soot. Nereid, though discovered in 1949, still has very little known about it. Triton was revealed as having a remarkably active past. Active geysers and polar caps were discovered and a very thin atmosphere as well, with thin clouds of what is thought to be nitrogen ice particles. At just 38 K (−235.2 °C), it is the coldest known planetary body in the Solar System. The closest approach to Triton was about 40,000 km (25,000 mi) and it was the last solid world that Voyager 2 explored close-by. Currently there are no approved future missions to visit the Neptunian system. NASA, ESA and independent academic groups have proposed and worked on future scientific missions to visit Neptune. Some mission plans are still active, while others have been abandoned or put on hold. After the Voyager flyby, NASA's next step in scientific exploration of the Neptune system is considered to be a flagship orbiter mission. Such a hypothetical mission is envisioned to be possible in the late 2020s or early 2030s. Another one proposed for the 2040s is called the Neptune-Triton Explorer (NTE). NASA has researched several other project options for both flyby and orbiter missions (of similar design as the Cassini–Huygens mission to Saturn). These missions are often collectively called "RMA Neptune-Triton-KBO" missions, which also includes orbital missions that would not visit Kuiper belt objects (KBOs). Because of budgetary constraints, technological considerations, scientific priorities and other factors, none of these have been approved. An orbital mission called Trident was officially proposed by the JPL for inclusion in the Discovery program in 2019. Neptune Orbiter mission — An orbiting mission concept focusing on Neptune and Triton. Argo — A mission concept New Frontiers flyby mission to visit Jupiter, Saturn, Neptune (with Triton) and the Kuiper belt with launch in 2019. ODINUS — A mission concept based on a twin spacecraft mission to investigate the Neptunian and Uranian systems. Launch date would be 2034. OSS mission — A proposed collaborative flyby mission by ESA and NASA. Its main focus would be to map the gravitational fields in deep space, including the Outer Solar System (up to 50 AU). Trident — Proposed mission, would perform a single fly-by of Neptune in 2038 and closely study its giant moon Triton. Direct flyby missions to Neptune are only preferable in window gaps with a 12-year interval, due to the complexity of planetary positions. There is currently a window open for launching a Neptune mission from 2014 to 2019, with the next opportunity occurring from 2031. These constraints are based on current rocket technology which relies on gravity assists from Jupiter and Saturn. With the new Space Launch System (SLS) technology in development at Boeing, deep space missions with heavier payloads could potentially be propelled at much greater speeds (200 AU in 15 years) and missions to the outer planets could be launched independently of gravity assistance. Space telescopes such as the Hubble Space Telescope have signified a new era of detailed observations of faint objects from afar, across the entire electromagnetic spectrum. This includes faint objects in the Solar system, such as Neptune. Since 1997, adaptive optics technology has also allowed for detailed scientific observations of Neptune and its atmosphere from ground-based telescopes. These image recordings now exceed the capability of HST by far and in some instances even the Voyager images, such as Uranus. Ground-based observations are however always limited in their registration of electromagnetic waves of certain wavelengths, due to the inevitable atmospheric absorption, in particular of high energy waves. ^ a b c d "Fact Sheet". JPL. Retrieved 3 March 2016. ^ a b Ulivi, Paolo; Harland, David M (2007). Robotic Exploration of the Solar System Part I: The Golden Age 1957–1982. Springer. pp. 424–425. ISBN 9780387493268. ^ See the "Neptune" page from JPL. ^ "Hubble Discovers New Dark Spot on Neptune". Hubblesite.org. NASA. 19 April 1995. Retrieved 4 March 2016. ^ See "Neptune:In Depth" from NASA. ^ Tom Standage (2000). The Neptune File: A Story of Astronomical Rivalry and the Pioneers of Planet Hunting. New York: Walker. p. 188. ISBN 978-0-8027-1363-6. ^ Chris Gebhardt; Jeff Goldader (August 20, 2011). "Thirty-four years after launch, Voyager 2 continues to explore". NASASpaceflight. ^ a b Clark, Stephen (25 August 2015). "Uranus, Neptune in NASA's sights for new robotic mission". Spaceflight Now. Retrieved 2015-09-07. ^ "Solar System Exploration" (PDF). Science Mission Directorate (NASA). September 2006. Retrieved 5 August 2015. ^ "Planetary Science Decadal Survey, JPL Rapid Mission Architecture, Neptune-Triton-KBO Study Final Report" (PDF). NASA. February 2010. Retrieved 5 August 2015. 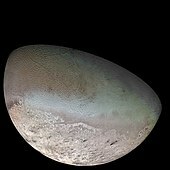 ^ "Neptune's Moon Triton Is Destination of Proposed NASA Mission". New York Times. 2019-03-19. Retrieved 2019-03-27. ^ "Origins, Dynamics and Interiors of Neptunian and Uranian Systems". Retrieved 5 August 2015. ^ "Astronomers Make the Case for a Mission to Neptune and Uranus". The Physics arXiv Blog. arXiv. Retrieved 5 August 2015. ^ Christophe; et al. (October 2012). "OSS (Outer Solar System): a fundamental and planetary physics mission to Neptune, Triton and the Kuiper Belt". Experimental Astronomy. 34 (2): 203–42. arXiv:1106.0132. Bibcode:2012ExA....34..203C. doi:10.1007/s10686-012-9309-y. ^ Candice Hansen; et al. "Argo - A Voyage Through the Outer Solar System" (PDF). SpacePolicyOnline.com. Space and Technology Policy Group, LLC. Retrieved 5 August 2015. ^ "Space Launch Mission" (PDF). The Boeing Company. 2013. Archived from the original (PDF) on 23 September 2015. Retrieved 6 August 2015. ^ William Harwood (3 July 2014). "NASA finalizes $2.8 billion Boeing contract for SLS rocket stage". CBS News. Retrieved 6 August 2015. ^ Oddbjorn Engvold (2007). Reports on Astronomy 2003–2005 (IAU XXVIA): IAU Transactions XXVIA. Cambridge University Press. p. 147. ISBN 978-0-521-85604-1. ^ Nemiroff, R.; Bonnell, J., eds. (18 February 2000). "Neptune through Adaptive Optics". Astronomy Picture of the Day. NASA. This page was last edited on 27 March 2019, at 06:00 (UTC).